RasterWeb! TenFourFox – PowerPC 4 Ever! 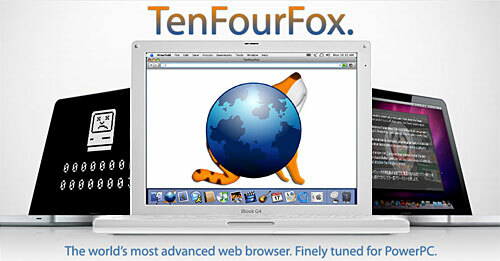 TenFourFox – PowerPC 4 Ever! I know all the hep cats out there have the latest Intel MacBooks to write their Ruby code on, but you would do well to remember that there are still a lot of useful PowerPC-based PowerMacs out there, being used daily for general purpose computing. These machines were the powerhouses of yesteryear at many a creative agency, and a lot of them have big drives, plenty of RAM, and are still running. They get passed down to folks who aren’t running any heavy apps like Photoshop, InDesign, or Final Cut Pro. And dammit, I want those people to be able to browse the web in a reasonably modern fashion. TenFourFox may be the best option now that Firefox 4 is out and has abandoned the PowerPC architecture. If there’s one thing we’ve learned from our years of using Macs, it’s that they outlast anything else out there. Why shouldn’t an iBook be able to look at embarrassing pictures on Facebook, or Twitter about our lunch break? These are our computers, dang it. We paid good money for them. They still work. There’s no technical reason they can’t do everything that a MacBook can. So if you want something done, you do it yourself, and we did. The result is TenFourFox. You’ve still got do deal with things like older versions of Flash (yuck) and QuickTime. I mean, everyone is abandoning PowerPC-based Macs, and it’s only a matter of time, but TenFourFox buys you some time, just like WaMCom bought us some time back in the old days… I’ve always thankful for the people behind these projects. They take on work that the so-called “official” software developers won’t, or can’t. I know there’s only so many hours in the day, and developer time has to be focused, but still… it’s always a shame to see working technology abandoned. Posted on Friday, April 22nd, 2011 at 6:04 pm. Subscribe to the comments feed. Both comments and pings are currently closed. Post on your own blog.